An incredible home cinema package, combining perfectly matched AV receiver and speakers. You can also stream wirelessly via Bluetooth and connect your turntable to the phono input. Earn 749 loyalty points when you order this item. 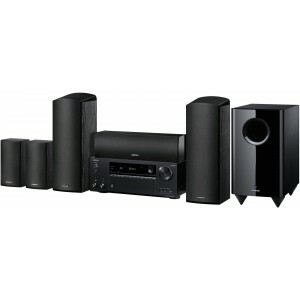 Onkyo HT-S7805 5.1.2-Channel Network AV Receiver and Speaker Package is designed to deliver powerful object-based sound that flows all around you for a realistic and immersive home cinema audio setup. The high-quality speaker system is a snap to set up, with AccuReflex phase-aligning object-based formats for super-clear multidimensional sound and benefiting from Onkyo's 70 years of experience in building premium Hi-Fi gear. Make object-based Dolby Atmos and DTS:X surround sound reality in your living room. Sound flows naturally above and around you in three dimensions, putting you literally in the centre of the action. Joining two large OMF woofers and dome tweeters inside the front speakers are special drivers that bounce discrete effects—such as bird calls, rain, the sound of a helicopter from the ceiling and into the audience. In fact, every element in object-based sound is mixed separately, so it’s free to travel from speaker to speaker, anywhere around the room. Each solidly crafted speaker in this 5.1.2 package reproduces next generation sound as its creators intended. AccuEQ equalises the surround-sound to suit the room acoustics for crisply focused sound, while AccuReflex aligns the phase of up firing height speakers with sound coming from your other speakers. Delay is resolved so that everything arrives at your ears at the same time. The result is cohesive reproduction of object-based soundtracks. A firmware update enables any audio source connected to the receiver, from vinyl to streaming audio, to be sent wirelessly via FireConnect to an optional speaker* placed anywhere in your home. Stable, fast, and easy to control with a mobile, it’s the smart way to set audio free. In addition to Google Cast and AirPlay, you can stream virtually any audio from smartphone, tablet, or laptop to your home cinema via Wi-Fi or Bluetooth. Available internet radio and music subscription services include Pandora, Spotify and many more. Select HDMI terminals (8 In /2 Out Including 1 Front) support 4K/60 Hz video, HDCP 2.2 copy protection, and High Dynamic Range (HDR) for next-generation UltraHD streaming and broadcasting on the latest TV sets. A phono input connects a turntable so you can enjoy your record collection, and we’ve also added easy-to-use universal Hi-Res Audio compatibility as well. Just use our phone app to find your 192/24, 96/24, or 5.6 MHz DSD albums on PC/NAS and relish the clarity and detail on your Onkyo home theatre.